Green Party President Peter Sinkamba says the Ministry of Health should develop a multi-disciplinary protocol to guide end-of-life care in Government hospitals. And Mr. Sinkamba says it is stripping the dignity of dead to keep their bodies in communal or side wards long after dying. “Yes, it is important to save a life. But it is equally important to provide complete end-of-life care which includes helping the dying person manage mental and emotional distress during final moments,” Mr Sinkamba said. He says there is need to develop a protocol which should guide physical, psychological, and even spiritual comfort to patients and relatives moments before and after breathing ceases. He adds that the protocol should provide guidance on complete end-of-life care which should also include helping other patients manage mental and emotional distress during the final moments of the deceased. 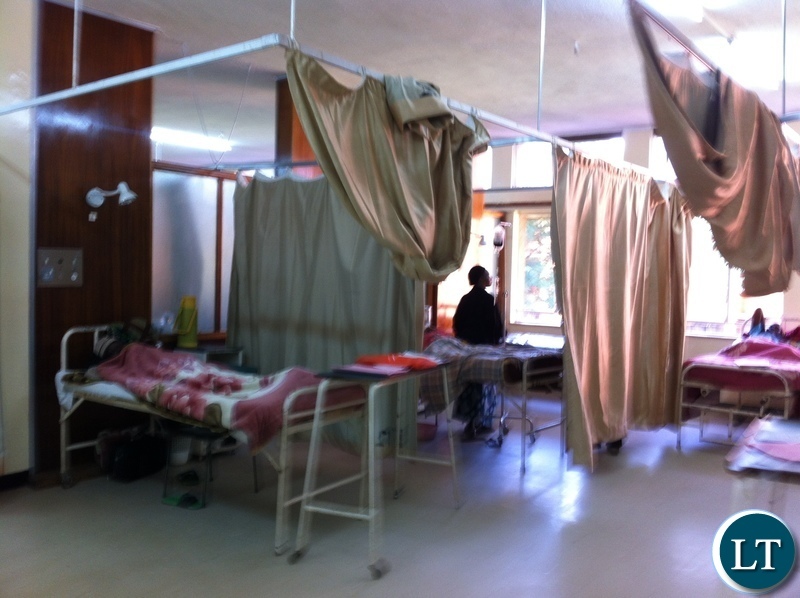 “In the last few months I have been to university teaching hospitals in Kitwe and Lusaka visiting patients. Regrettably, what I have noted is that whilst doctors and nurses put in their best to treat patients, they are critically let down by limited or even lack of resources to provide quality end-of-life-care,” he said. “You see, in a hospital setting, it is common occurrence for patients to die in a shared room or communal ward. For some patients entering the final stages of their lives, the end of their journeys can be terrifying and distressing due to death rattle. The effect of witnessing death rattle has implications not only on the relatives of patients but fellow patients as well. “It should be a policy of government hospitals to move patients near to death from communal wards or shared rooms to isolation rooms. This should be mandatory policy in government hospitals for a number of reasons. First, there is need to maintain privacy and dignity for the patient and her or his family during those final moments. Secondly, there is need to protect other patients from having to witness distressful deaths. Unfortunately, this is not happening due to lack of or limited resources. Government needs to seriously invest and guide in this aspect,” Mr. Sinkamba said. “I have noted that if patients encounter a number of distressful deaths, this has a negative effect and they become depressed and withdrawn, perhaps feeling that ‘I the next one to go will be me’. They become withdrawn and unwilling to interact. They choose to distance themselves from their fellow patients. They become even more upset by witnessing the death of someone with whom they had developed a relationship. You worsen their agony by preparing the body for mortuary whilst they are watching. And to make matters worse by keeping the body in the communal ward for several hours or even until the next day. That should never happen at all as a matter of policy,” he said. Right course Sinkamba but you still fell short .Improve Zambian whole healthcare system so that none of you political bigwigs have to be evacuated to foreign hospitals. In some countries the doctors tell patients when they expect to die, like when to expect birth of baby. But I doubt if Sinkamba is being morally right here. With these unethical Zambians those dying will be riducued with WhatsApp pictures etc. Zambians even take video of dying in accident, instead of helping them. Sinkamba deserves my vote one day. But sometimes politicians speak good words when they are not in power. Imwe ba Editor sure you can’t think of a less confusing headline than that? Yayi mwe! Crazy idea. Why discriminate? It would send bad signals to patients and relatives. The should be no slaughter room’s in hospitals. Every patient hopes they will well. Immediately you move them the dying room, that hope would be gone. Sorry this is a crazy idea that should be ignored. Imwe fyonse about Sinkamba is bravo. Maybe Sinkamba is about to die, instead of wishing him comfort you are calling upon Chitalu to build hospices. It’s not ministry of health, but ministry of social welfare who should be able to work in hopitals . How do possibly tell that this patient is near death? Exactly my thoughts @Dokowe. Everyone including relatives will know that Doctors have failed and we should start prepYfor a funeral. Bank cards and PIN numbers collected and money withdrawn. Result: kill me quick! @Chaos theory reloaded. Shouldn’t the same doctors have told ECL and company that so and so will die even when you evacuate them to SA. If it’s like this it amounts to our doctors abandoning all hope for any patient they feel/know is about to die. Kind of unethical, don’t you think? I imagine Doctors instructing nurses like so, “no medicine for this one, s/he will die in the next few hours, just put them in the isolation ward.” Now, if the patient knows they are in isolation ward (were patients are taken to die), how does it help the patient with mental and emotional stress? This can only be achieved in an environment where professionals are let to do there work without political influence. Standards can only be achieved when certain hands of manipulation are dispensed with. Doctors and other medical professions fail to do their best because of being controlled like puppets. We needs to create an atmosphere where individuals are able to do their job minus fearing reprisals. That is where HPCZ should come in to monitors standards in hospitals and clinics. Shinkamba is a good man…. The whole world is a departure lounge my friend. No one ever made it out of here alive. Well said sinkamba ,people who are comment negative on your brilliant idea have no clue what it means to work in the health sector.those who live in diaspora know that each patients have their own private rooms,thats how most of western hospitals are built.its was a missed opportunity building the levy mwanawasa hospital the communal setting format. Even for cancer no one can predict the exact minute. Life is complicated. My take is therefore to get rid of these communal wards, partition the existing even with boards and build community funded extra wards that have a room per patient. Can you imagine being the one being moved to these gas chambers? So Peter wants Government to create a ZP or zabwino palibe ward in hospitals. Now suppose I survive ba Sinkamba, how would I consider a doctor who recommended me for ZP, a prophet of Doom? Sounds like a good idea but in reality it’s a bad idea because the reasons why someone is not taken to the mortuary immediately that person dies is that he /she can still came back to life. The other reason is that taking people who are about to die from the ward’s can not stop the mental tourtue in those who remain in the ward as they may also anticipate that they could be next. All in all anyone who goes to the hospital should be prepared to see dead bodies. Great idea. Anyone who has been in a developed country will know this happens and that’s the reason you lot sing hosanna hosanna to go into their hospitals. It’s ignorance to conclude that you need the doctor to tell you exactly minute you loved one is dying. The doctor will estimate in days, weeks or months or years how long a patient with a serious illness is expected to live. Peter is right not just doctors you need also other professional such as psychologist and priest to offer support to family. Patients who go into isolated wards are patients who are critically ill, can’t talk or breath independently hence they are not even aware of the surrounding they are in. Please use some educated sense not common sense. FYI iam a secondary school drop out. I think what he meant was set up palliative care services.